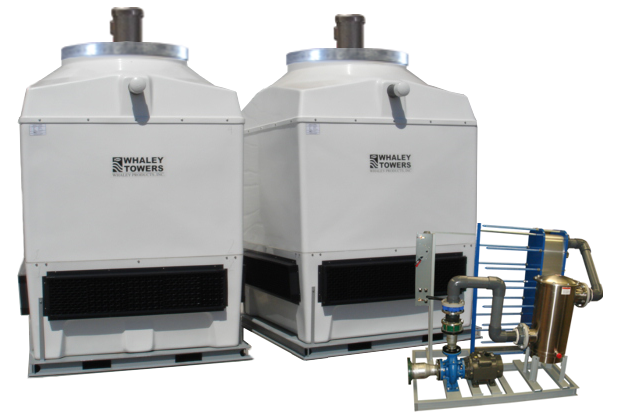 Closed Loop Cooling Tower - Closed Loop Chillers - CLS Series | Whaley Products, Inc.
Whaley's CLS-Series cooling tower systems offer a simplified installation and maintenance approach for a variety of applications. When CLS-Series is utilized, both the cooling tower/s and heat transfer skid are installed outdoors. The heat transfer skid is installed outdoors because there is not room inside the building for a reservoir and heat transfer skid. If there is room for an indoor reservoir and/or heat transfer skid, then Whaley's CLIO-Series would be the best configuration. With a CLS-Series configuration, the cooling towers are typically installed on ground level, and the pump on the heat transfer skid pulls out of the cooling towers in parallel. In cold weather climates, a basin heater package is necessary to guard against freezing inside the cooling tower. Basin heaters are selected based on the installation locations worst possible climate conditions. In terms of maintenance, WPI's closed loop cooling tower components are easily accessible, easily taken apart, easily serviced, and expeditiously back up and running. Instead of an expensive internal copper or stainless steel heat exchanger coil, WPI utilizes an external plate & frame heat exchanger. If there is a problem with copper or stainless internal heat exchanger coils, typically they require replacement. It is difficult to service them because they are inside the cooling tower, and the diameter of the coils are so small, a simple clog could be fatal to the coil. WPI's external plate & frame heat exchanger is easily taken apart for cleaning or servicing, and put back together. Additionally, Whaley typically designs the heat exchangers with the ability to add more plates in the future, so this would allow room for simplified capacity expansion in the event the application's heat load increases. Also, given the fact that all of WPI's internal cooling tower components are CTI Certified plastics and stainless steel. A flushable external inline strainer is used to allow proper filtration of the cooling tower loop, and also provide a simple means for taking apart, cleaning, and/or replacing the screens. Most customers like to keep a spare screen available, so when you are cleaning a primary screen, you can put your secondary screen in and keep the process running. Another option available is an electric automatic strainer flush timer, or a pressure transducer based electric automatic strainer flush.